She jumped. She soared. She won. And Caricia Andrews won the state championship. 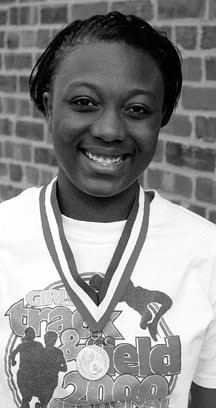 Andrews won the long jump in the recently held Class AA girls track and field meet in Charleston. She made an 18' 4-1/2'' jump on Friday and it stood up for the entire two-day event. Andrews also owns the school record in the event and placed 5th at State last year as a sophomore. Andrews also becomes the first Silver Streak female to ever win a state title. The last state champions Galesburg produced were Nate Bobofchak and Jason Gunther, who won the Class AA tennis doubles. The daughter of Allyson Andrews, Caricia also played volleyball for the Streaks last fall and is a basketball cheerleader. She's also just a junior -- as is Ardith Johnson, who had a fourth and fifth place finish in the hurdle events at State. I caught up with Caricia Andrews Monday evening after a busy weekend. ''Got your medal?'' was the first question asked. Andrews smiled, reached in her purse and pulled it out. 1. Was your jump that won state your longest of the year? No, I made 19' 3'' at an indoor track meet at Knox College earlier in the year. That's been my best jump and I also went over 19' at Burlington. I made a good jump to win but not the best I've had all year. 2. Do you prefer indoor meets to the ones held outdoors? Not really. Wind is always the biggest factor because running into it slows you down. One of my better jumps this year outside was at Burlington with the wind at my back. But either indoor or outdoor is fine, the big thing for me is the sand in the pits. Some are good and others are horrible, like gravel. 3. What were the worst pits you landed in this year at? Geneseo. Oh they were bad, real bad. Like landing in cat litter. I actually cut my knee landing there this season. 4. What's the key for Caricia Andrews to make a great jump? The stride you hit on the runway leading into the jump and the height you get off the scratch board. 5. Do you take off on your left foot or right foot? Left, always left. In Springfield this year, I accidentally took off on my right foot and I knew things weren't right. It was a strange feeling. 6. How many years have you been long jumping? Just since 8th grade at Churchill. I was on the track team and my coach moved me to that spot. He thought I'd be good at it and he wanted me to compete in a field event. 7. Did you compete first, in the middle of the pack or last at state? Last. It's based on your best jump of the year and mine was good enough to make me the last to compete but that was fine. I could watch the other girls jump and I knew where I was at. 8. Did you do better on Friday or Saturday? Friday is when I got my best jump. Actually, Saturday I didn't do very well at all. But Coach Fischer told me Friday night it was mine to lose, that it was in my pocket. 9. After finishing 5th at state as a sophomore, you didn't have a bad case of the nerves did you? No, that was a big help to me, the experience that I had. I wasn't nervous at all, I just tried to enjoy things. 10. Does being the first female athlete to win a state medal add much significance to your achievement? I'm sort of speechless about it. Coach Fischer was the first to tell me about it. Maybe it'll sink in later when I'm a Grandma. My goal was to win this as a senior so this is pretty awesome. I guess I'll always be remembered as the first. 11. Does your achievement put to rest the notion that cheerleaders aren't athletic? I hope so because cheerleading is very controversial at the high school. We hear all the time that we're not athletes -- that we're window dressing. We've heard it all. Some people make fun of us. But yet we have cheerleaders with a 4.0 grade point average. We have cheerleaders on the high honor roll. There are cheerleaders who play different sports. We practice, we lift, we can get hurt, we work together. 12. Do you train in track during the off season? Mostly it's just seasonal although a coach will work with me this summer for the first time. Mostly, I play volleyball. 13. The girl you beat out from Rantoul is just a sophomore. Do you expect to see her again next year? Oh yeah. I had seen her before at the Bloomington Invitational and knew she was good, real good. I'm sure that she'll be back at state next year as well. 14. Did you meet Jackie Joyner-Kersee when she was in Galesburg watching a Streaks boys basketball game last November? No, but I got her autograph. But I'd love to break her record in the long jump. 15. Which sport do you prefer to compete in? What's your favorite? Track. I like them all but track is probably my favorite. 16. 5th place was a great finish for the Streaks wasn't it? It was and hopefully we can do better next year because we lose only two seniors. It was also great that we finished ahead of Moline. I didn't care if it was just by one point. They have so many girls on the team and are so deep it was great to finish ahead of them. 17. Ardith Johnson is another junior that placed very high there. Did you see her race? Yeah and she did a great job. She was right there, real close but hit the next to last hurdle with her trail foot and that hurt her. She'll be back next year and be even better. 18. What's been the reaction to this since you got back to Galesburg? Everyone has been great, at school and at home. It was great to come back to. 19. The state track meet wasn't televised live was it? No. The first time it was televised on a tape delay was last Monday night but it'll probably be on a lot more in the coming weeks. 20. What goal do you have for next year? To reach 20'. That would be a great distance to get. I think I can do it.